Black Krim tomatoes are medium-sized, beefsteak-type tomatoes with a flattened globe shape. The outer skin is dark maroon, although with sufficient sunlight and heat they can turn almost black, with greenish-brown shoulders. The flavor is intense, with a sweetness that is balanced by notes of acidity, giving it a distinct, slightly salty taste. Black Krim tomato seeds mature late, but are prolific producers of the large fruit, which weigh an average of eight to twelve ounces. The heat-tolerant, indeterminate plants are exceptionally hardy, and can adapt well to adverse conditions in a wide range of climates. Healthy vines can reach six feet or more in height, and they typically require staking or caging to support the high yields of large, heavy fruit. Black Krim tomatoes are available in the summer and the fall. 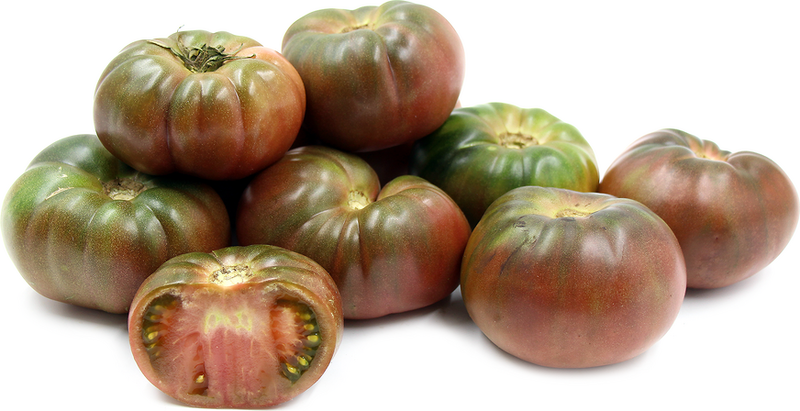 The Black Krim tomato is named for its dark, black-purple coloring and its origin. “Krim” is the Ukrainian word for “Crimea,” the Ukrainian island where the Black Krim was cultivated. It is considered one of the best black tomato varieties, and it consistently wins top place and receives rave reviews at taste trials. It has gained notable popularity on the West Coast of the United States, although it is a favorite of chefs worldwide. The Black Krim tomato is an heirloom variety belonging to the beefsteak group of tomatoes, and it is botanically known as either Lycopersicon esculentum or Solanum lycopersicum, 'Black Krim'. Like all tomato varieties, Black Krim tomatoes are rich in fiber, vitamin A and vitamin C. They are also a good source of lycopene, a natural antioxidant known to prevent cancer. The dark purple coloring of these tomatoes is the result of an increased level of anthocyanin, a natural pigmentation with strong antioxidant benefits. Regular consumption of black tomatoes, and other anthocyanin-rich foods, may help to protect against coronary heart disease. The rich, slightly salty flavor of Black Krim tomatoes makes them great for fresh eating, or for use in juices and cocktail drinks, such as a Bloody Mary. The Black Krim tomato is best suited for slicing and adding to salads or sandwiches, but can also be used in making sauces. Try drizzling slices with olive oil and a sprinkle of sea salt, or topping with fresh mozzarella, basil, olive oil and balsamic vinegar. Store tomatoes at room temperature until ripe, after which refrigeration can slow the process of decay. It is believed that the seeds of Black Krim tomatoes were gathered and saved by soldiers returning home at the end of the Crimean War, and were likely passed down through the generations of the soldiers’ families and shared across neighboring towns until being officially introduced in 1990 out of the Isle of Krim. The Black Krim tomato originates from the Isle of Krim in the Black Sea, near the Crimean Peninsula of Ukraine, and was introduced to the market in 1990 by Lars Olov Rosenstrom of Bromma, Sweden. Recipes that include Black Krim Heirloom Tomatoes. One is easiest, three is harder. Someone shared Black Krim Heirloom Tomatoes using the Specialty Produce app for iPhone and Android. Sharer's comments : Black Krim Heirloom Tomatoes spotted at Rockin A Farm Corvallis OR 97330.